plasmapheresis, rapid infusion of fluid among other uses. resistant, extremely biocompatible with excellent wear properties and elastic memory. Three separate non-communicating vascular access lumens within a single catheter body. Proximal lumen for blood sampling, medications and blood administration. Distal lumen for CVP monitoring, blood administration, medications. 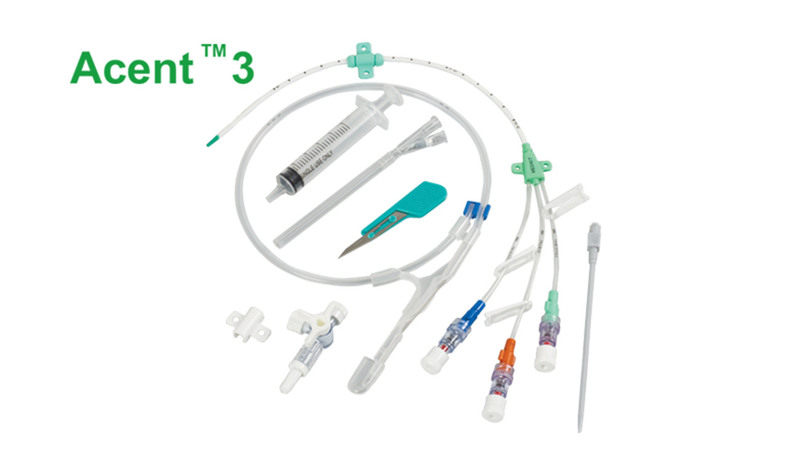 Medial lumen exclusively for total parenteral nutrition. Reduces the necessity for multiple venipunctures. proportion to the catheter’s French size. Coaxial catheter design maximizes inner diameter of central lumen for high flow capacity.